So this happened after people asked me about how to make a widget. This makes a slightly customizable widget that will let you have a slightly customized login form via a widget. As with all hacks, you’re on your own for support. Code is GPLv2, and it should be translatable. 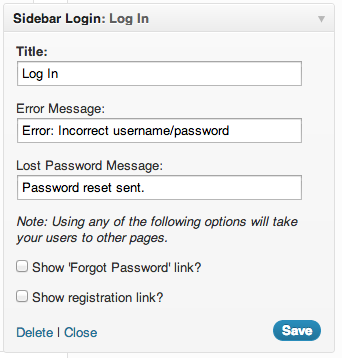 <?php /* Plugin Name: Sidebar Login Widget Plugin URI: https://halfelf.org/hacks/sidebar-login-widget Description: Sidebar Login Form via widget Author: Mika Epstein Version: 1.0 Author URI: https://halfelf.org/ Copyright 2012 Mika Epstein (email: ipstenu@ipstenu.org) Sidebar Login Widget is free software: you can redistribute it and/or modify it under the terms of the GNU General Public License as published by the Free Software Foundation, either version 2 of the License, or (at your option) any later version. Sidebar Login Widget is distributed in the hope that it will be useful, but WITHOUT ANY WARRANTY; without even the implied warranty of MERCHANTABILITY or FITNESS FOR A PARTICULAR PURPOSE. See the GNU General Public License for more details. You should have received a copy of the GNU General Public License along with WordPress. If not, see <http://www.gnu.org/licenses/>. // This is the widget!